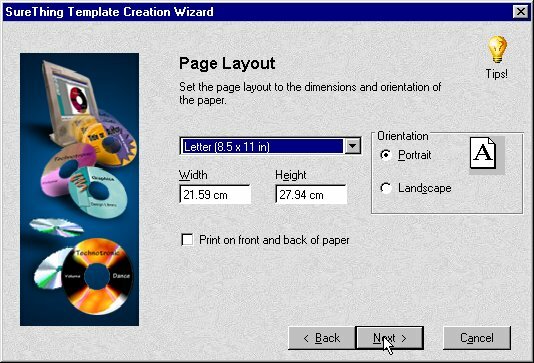 At the Page Layout screen, select the page size from the pull down menu. You can also change the orientation of the layout if needed. The orientation setting will change whether the text is printed to the paper in a vertical orientation (up and down) or a horizontal orientation (left to right) when fields are rotated at 0 degrees. This does not refer to the way the paper is fed into the printer. SureThing always prints in portrait.